Gears of War 4 April Update announced with many new features. The latest update is bringing the goods with a themed Easter Event, ranked play improvements, new maps, additional legacy characters to collect and more! Read on for all the info. 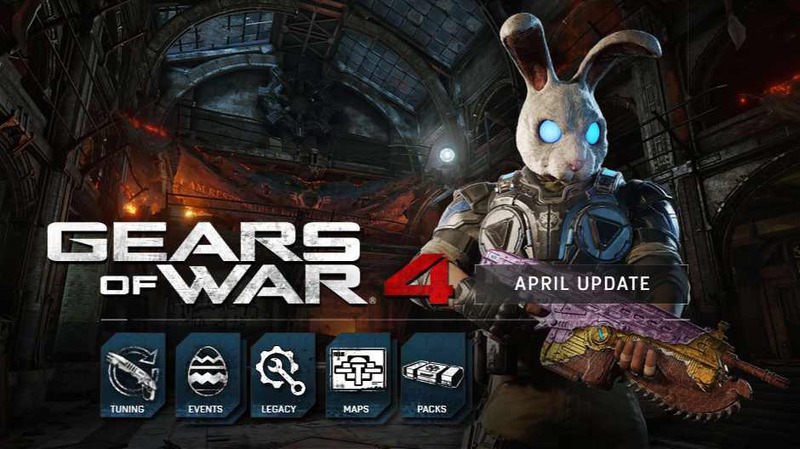 The new Gears of War 4 Easter Event will kick off with ‘Bunny Hunt’, an Easter-themed game mode that brings back the oversized Bunny Heads from previous games into a new variation of Guardian. On top of that, fans will get to unwrap five Chocolate Easter Egg themed weapon skins by registering on GearsofWar.com and completing challenges in this special playlist. This month brings two maps from Gears of War 3 updated and refined to Gears of War 4: Hotel and The Slab! Hotel was a classic part of the Gears 3 lineup, and we’re excited to bring it back for fans. The hotel is now set on a misty cliff-side, with a long-abandoned reclaimed beauty look that feels right at home in Gears 4. Combat still has a distinct feel between the inside and outside environments, with the longer-range street fight clearly separated from the frantic cover-to-cover battle on the interior. New weapon swaps like the EMBAR now appear on the map, freshening up the familiarity of Hotel and having you learn an old favorite all over again! Cell Block 38 in The Slab was where Gears began. Last seen as a post-launch map for Gears of War 3, we return again to Marcus’ prison. For Gears 4, we’ve honored the originals look while cranking up the detail, including a windflare coming dangerously close to the prison. The Slab has a unique two-lane opening separated by an interior courtyard, encouraging plenty of Gnasher and ranged combat despite the smaller size of the map. Both maps will be available for Season Pass holders to play from today in the Developer Playlist, with Double XP and 20% Bonus Credits to boot. Hotel and The Slab will be available for all to play in Public Matchmaking from April 11 onwards. Kantus is coming back this month. On top of new things to earn, there’ll be new things to play too! Our monthly Horde and Versus events are all about playing Gears of War 4 in a different way – save the date and get involved on April 21 and 28 respectively. The new Rank improvements and weapon tuning are coming this month. These tuning changes provide a major update to both Core and Competitive play. Our Core changes mostly focus on making the starting weapons fit their role better than before, with reduced range on the Gnasher, improvements to the Hammerburst and slight tweaks to the Lancer. For Competitive, it’s all about adjustments that highlight the teamwork and competitive nature of playing with these team-focused settings. The team is also making a number of improvements for Ranked Play including Seasons, Season Rewards and more!